This beautifully delicate scallop shell is made of pinky-coral-coloured Mother-of-Pearl with a gold plated edge. It hangs on a gold-plated chain. 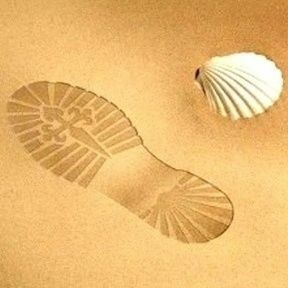 The scallop shell / concha de vieira is the symbol of the Camino de Santiago. The 1,000-year-old Way of St. James (El Camino de Santiago - in Spanish), criss-crosses Western Europe, arriving at Santiago de Compostela in Northern Spain on the Atlantic coast. Some 200,000 people travel the Camino each year from all over the world: Some people walk, others travel by bike. Many travellers choose to do the Camino for personal, rather than any spiritual or religious reasons - taking time out from their busy/modern lives and perhaps finding inspiration along the way, whilst reflecting on their life in a supportive environment. Many carry with them a Scallop Shell symbol. Everyone experiences the journey in a different way. If you want to wish your friends or colleagues well and show them that you are thinking of them, let us send this pretty inspirational present on your behalf. It is the ideal gift for any special event or ooccasion, or for someone starting a new job or a new life, travelling afar or maybe even for retirement. 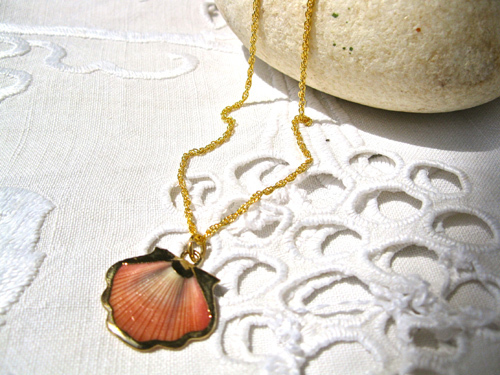 Dimensions: The scallop shell measures 25mm long inc the hanging ring, by 25mm wide, and hangs on a pretty gold-plated rope chain of 45cms (17.5") long. It is possible to lengthen the chain with a 5cms (2ins) extender chain; Please choose in Options Box. Gift this pretty pink scallop shell necklace to inspire your friends and loved-ones and help them to be fortunate in their life. Comes gift-wrapped, like all our presents - and we can print a personal message on your behalf.